Perspective is a great help in drawing realistic block-shaped things, like houses and ancient city walls. Think of a road stretching out before you. The edges seem to get closer together the further off you look, and seem to meet at the horizon. This is what we mean by perspective. 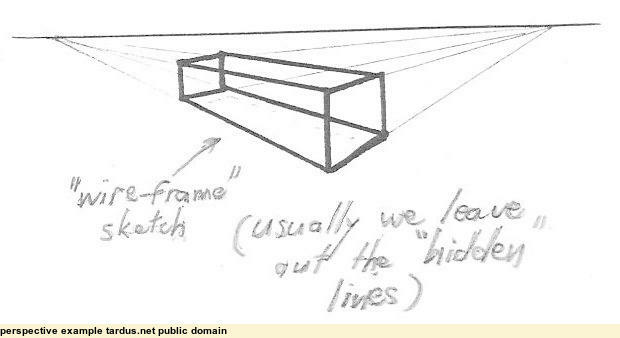 The simplest method is called "single point perspective". We use this when the block-shape we want to sketch has one of its main sides directly facing us (ie, parallel to the horizon). 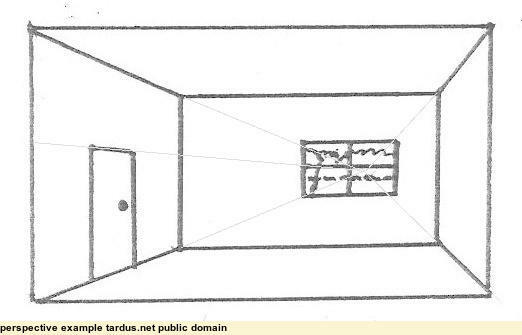 In practice it is most often used for drawing the inside of a room. 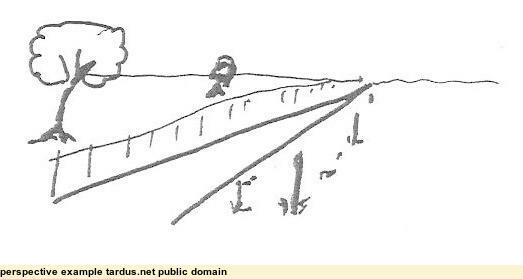 We just draw that face, and then draw faint or imaginary lines from every corner to a point (the "vanishing point") on the horizon (which we represent as a horizontal line behind the block-shape). We then draw in the other edges that we can see, either along these faint lines, or vertically, or horizontally. We get different affects by moving the horizon above or below our viewpoint, and by moving the vanishing point to the left or right. We use this when none of the faces of the block-shape face us, but instead one of the corners does. This is what we mostly do for the outside of a building. This time we have 2 vanishing points, one to the left and one to the right. We start with a vertical line, which is the corner nearest to us. We then draw faint lines from its top and bottom to each of the vanishing points. As before, we then draw in the other edges that we can see, either along these faint lines, or vertically. As before, we get different affects by moving the horizon above or below our viewpoint, and by moving either vanishing point to the left or right.